Canberra truly is the Bush Capital, with an enormous range of native animals on our doorstep. We have a vast range of birdlife, from small finches to majestic wedge tailed eagles, and observing them in our backyards and our parks is a pleasure that most Canberran’s can enjoy on a daily basis. 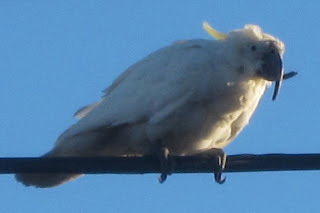 All types of parrots including galahs, rosellas, corellas, and cockatoos can be affected by psittacine beak and feather disease (PBFD). Psittacine beak and feather disease is a debilitating disease. It is highly contagious and can be spread through feather dust and faeces. It is comparable to the human AIDS virus as it suppresses the immune system. The disease fighting ability of the birds is compromised and any small illness could prove fatal. The side effects of PBFD include deformed feather growth which leads to baldness, and beak and nail overgrowth. The beak of a diseased bird can grow so long that the bird can no longer feed itself, meaning that it will eventually starve to death. Birds may exhibit some or all of the symptoms of PBFD such as baldness, overgrown beak, severe weight loss, and the inability to fly. At the point where the birds are no longer able to fly, the disease has completely taken over and starvation is likely to follow shortly afterward. At this point, birds are also very vulnerable to predators. Please help stop the spread of this terrible disease by ceasing to use feeding stations. Rather than providing food for native birds, instead allow them to exhibit their natural foraging behaviours by planting native plants in your yard. Hey, thanks for that info, I was thinking of setting up a feeding table to be be kind, but it is kinder to let birds find their own dinner!